India has well established airline infrastructure. Airlines of more than 50 countries are operating services to/from India. Links to international and domestic airlines operating to/in India can be found here. 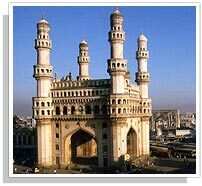 A few international flights are also operating to and from Hyderabad. And Hyderabad is well connected to major cities and states in India by air, rail and road. Travel tips, help desk, hotel guide etc for travelers are available at Ministry of Tourism site. Air Travel: Air India, Indian Airlines, Jet Airways, Sahara Air, Emirates Airlines, Malaysia Airlines, Kingfisher Airlines, etc are operating flights in and out of Hyderabad. Detailed Flights Information can be found here. Train Travel: The Indian railway, the world's largest railway under a single management, today is divided into nine zones. Secunderabad, the twin-city of Hyderabad, is the headquarters of the South Central Zone. All major trains stops or departs from here. The schedule, availability of tickets etc can be found here. Road Travel: The Andra Pradesh State Road Transport Corporation (APSRTC) connects Hyderabad to every city, town and all except very small villages in the state. Express and luxury coaches are available for inter-city and interstate services. Chauffeur driven private cars and taxis for long distance travel are available in Hyderabad, operated by Andra Pradesh Travel and Tourism Development Corporation (APTTDC) and private operators. Visa issuance rules: Please see Visa Information here.